Khusro Ansari is considered a marketing guru, with a flair for numbers. He is a talented serial entrepreneur who is not scared of taking risks and venturing into untested territories. Khusro has gained a reputation that many have been striving for. His skill of understanding the gaps in the market and creating opportunities through them has taken SEED to new levels. He strongly believes in the power of an idea and that there is no replacement for human talent and the intention to work hard. He has had exposure to both client and agency environments and stands apart in the world of marketers. Khusro brings with him a wealth of industry experience, ranging from manufacturing and retail to advertising and marketing. A man with a positive demeanour, his superb marketing skills, peoples skills and strategic planning have given him success on all forums. 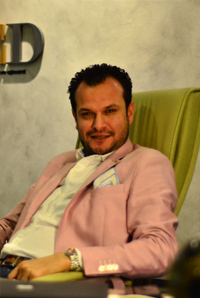 He is the Director & Co-Founder of SEED, Gizelle Communications (Pvt.) Ltd., Stimulus (Pvt.) Ltd., FK Squared, Globus, Bridging Britain, The Food Company (Pvt.) Ltd. and Colours of Inspiration. Before he set up his own company, Khusro was working as Project Director at Tesmart (Pvt.) Ltd. Pakistan, affiliated with TESCO of UK, a chain of international supermarkets. He eventually ventured into entrepreneurship and with his partner, and formed Gizelle Communication (Pvt.) Ltd. in the year 2004, which specializes in integrated Corporate Social Responsibility (CSR), infra-structure development and media solutions while amalgamating conventional advertising methodology with the principles of CSR and community development. His great attention to detail, perceptiveness and brilliant social skills have served as monumental contribution in the progress of the organisation. He has discovered the potential for new opportunities and has come a long way from Gizelle to SEED, that now acts as an umbrella company for all the ventures that he has been involved with. Khusro’s expertise in the field of Marketing & Strategy has earned him respect amongst peers and clients and he continues to draw attention with his impeccable projects and his modus operandi. His understanding of public private partnerships and creating sustainable business models for the initiatives by SEED have been the key factor behind the success of the enterprises under the banner of SEED.